Great for commuting! The Ogio Hampton's Tote has a fully padded fleece lined laptop compartment with elastic closure that fits most 15” laptops. 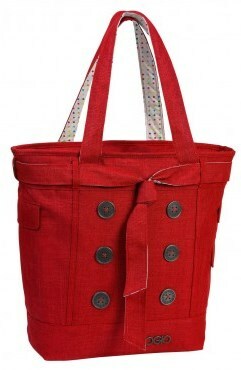 With it's patterned lining material and darling buttons, this bag is as fun as it is functional. I love this bag! I was on the hunt for a stylish bag that could carry my laptop. Turned out that was a difficult order to fill. Most laptop bags are utilitarian in style. Then I found the OGIO Hampton. I'm in love. It has a protective compartment for a laptop. 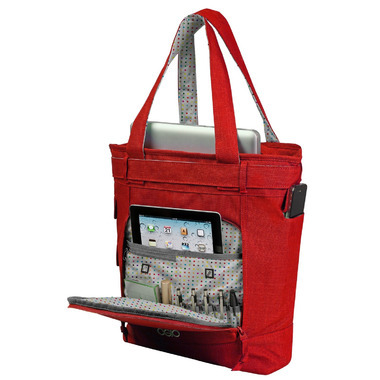 It also has a separate compartment in the front of the bag for an e-reader or tablet. I love all the pockets and best of all, the decorative buttons and tie are very cute. Love this tote bag ! It's great value for the price! Bought one for my daughter and she loves it too ! This bag is the perfect gift for my mother in law who is now 90. She always carries a bag with her. She loves red and the buttons and bow decoration on the front are perfect. I really love this bag! It's so practical, I love all the pockets and dedicated storage for pens and the like. The outer side pockets are not that functional for me, but there's so much other storage it doesn't matter. I don't have a laptop or a tablet, but the extra padding in the bag is nice regardless. Great purchase.